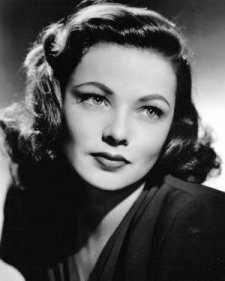 Another of the silver screen's most striking beauties, despite her angelic appearance, Gene Tierney proved herself to be an actress who could play jealous, conniving women very effectively... and she did just that in several of the three-dozen films she made in the 1940s and '50s, most of them for 20th Century-Fox. 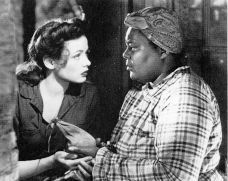 Tierney with her Mammy Lou (Louise Beavers) in BELLE STARR (1941), which features the beautiful brunette as the title character, a passionate, headstrong Southern belle turned notorious female outlaw in post-Civil War Missouri. One of her earliest films for 20th Century-Fox and a movie rarely screened in any format anymore, BELLE STARR contains some of the 1940s' most derogatory depictions of American negroes. (Such derisive caricatures would be toned down considerably after the United States entered World War II in an effort to promote racial unity.) In the context of Tierney's career, BELLE STARR exemplifies the kind of diverse starring roles the young actress played early in her career before the executives at Fox really figured out what to do with her. 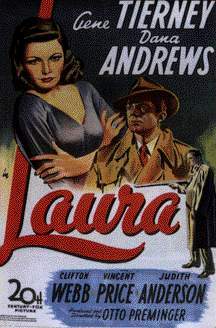 Although she had already starred in almost a dozen films, it was LAURA (1944) that established Tierney's most popular screen persona and became her most famous film. Also starring Dana Andrews, Vincent Price, Clifton Webb and Judith Anderson, Otto Preminger's masterful film-noir murder mystery LAURA features Tierney as the title character, an apparent murder victim whose glamorous, alluring portrait haunts the detective on the case. It is interesting to note however, that this quintessential film noir was not so described at the time of its release because the term "film noir" (used to describe movies with cynical, imperfect heroes and a dark, brooding photographic style) was not invented by French film critics until the mid-1950s when they were finally able to see the Hollywood films, like LAURA (1944), that had been unavailable in Nazi-occupied France during World War II. "Laura" (clip) by David Raksin (a .MP3 file). "Original Theatrical Trailer" (a .MOV file courtesy AMC). 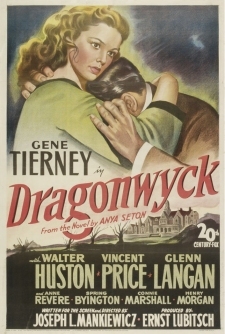 In DRAGONWYCK (1946), her fourth and final film with actor Vincent Price, Tierney plays a tenant farmer's daughter who is sent to live in the mansion of her father's wealthy landlord, Nicholas Van Ryn (Price), but soon finds herself caught up in romantic and political intrigue when the farmers revolt against the aristocrats. Set in mid-19th century New York, this gothic noir-thriller features noteworthy supporting performances by Anne Revere, Henry Morgan and Spring Byington and also marked the directorial debut of screenwriter-director Joseph L. Mankiewicz.